Can the zines be loaned to other libraries? How can I search for zines through Barnard Library's online catalog? I am looking for a particular zine. Will it be in the catalog? Can I make copies of the zine for my personal use or digitize them without permission and upload them to the Internet Archive or wherever? Do you have a mailing list for programs, events, workshops and other zine stuff? How do I get to the Barnard Library? Once you get here, remember that there are two sets of zines: stacks and special collections. 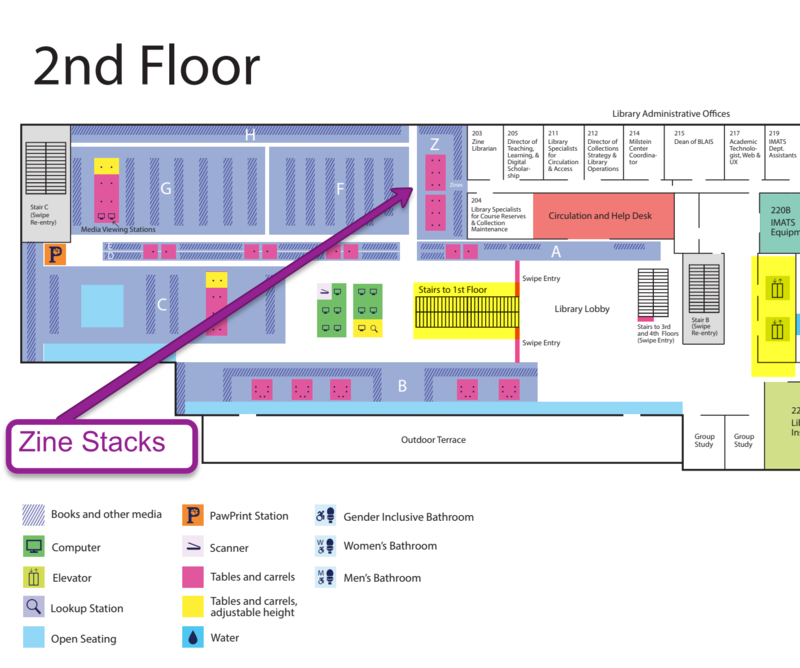 The stacks are located on the second floor of the Milstein Center for Teaching and Learning. A zine with a call number of B731 would be in the box with the call number range of 'B68f-B74a no. 15.' Note that B731 comes before B74a. Special collections zines must be requested ahead of time, and it is helpful to identify which box a zine is shelved in. There are approximately twice as many zines in special collections and hundreds more that haven't been processed yet and are not yet listed in CLIO or are listed, but not yet in the stacks. If there is something in particular that you are looking for and can't find it, please email the zine librarian. Zines are subject to the same circulation regulations as other materials in the Barnard and Columbia libraries. People with BC/CU ID, people in the BorrowDirect network, and MaRLI can borrow zine for a semester at a time, plus renewals. Stacks zines are available via Interlibrary Loan. Please go through the normal ILL channels at your local library. 1. Access Columbia Libraries Online Catalog (CLIO). Visit clio.columbia.edu/catalog, which will take you to a page that gives you the option of doing a basic or an advanced search. (These instructions are for a basic search). 2. Enter the name of a specific zine, omitting the initial article (a, an, the, el, la, etc...) or conduct a general search by using other keywords. 3. Click on the Title to see the zine's record. 4. The zine's record contains information about the zine: its author, its call number within the Barnard zines stacks, its subject headings, a short summary of its contents, and more. Many of the zines available are currently in CLIO, but some others have yet to be processed. When in doubt, you can always ask the Zine Librarian. For example, <zine?> and your topic, e.g. "body image," "privilege," "race," "recipes," "riot grrrl" will yield results that are zines of those topics. Many zines are not yet cataloged, so if you are looking for a particular title or topic that is not in CLIO, please ask for help. Aqsa Zine #4 Ancestors + Descendents. Sept. 2011. Print. Researchers may scan, photograph, or otherwise reproduce zine text and images for their own use. Researchers may not publish zine images or substantial amounts of text in print, on the web, or in any public format, without making every effort to secure permission from the zine creator. If the zine creator is deceased or difficult for the researcher and zine librarian to locate, discuss other options with the zine librarian. All zines are protected by copyright unless they contain an anti-copyright statement. Read and contribute other special zine copyright/fair use statements on the Zine Libraries website. Yes! Sign up at https://groups.google.com/a/barnard.edu/forum/#!forum/zine-list (you will need a Barnard UNI to do this on your own. If you don't have one, email zines@barnard.edu to be added). Another way to keep in touch with us is by following us on Facebook, Instagram, and Twitter. Barnard College is located on the Upper West Side of Manhattan between 116th and 120th Streets along the west side of Broadway. The Library is on the second floor of the Milstein Center, which you can find on the Barnard campus. The Zine Collection is housed within the library, so our hours are the same as those for the rest of the stacks.